Queen Victoria was passionate about jewellery, wearing it, designing it and giving it as gifts. The early part of her reign saw much romantic jewellery. This era saw fine craftsmanship and innovative ideas, diamonds were set on springs to catch the light and sparkle as the wearer moved. Many pieces were made with detachable and interchangeable parts to enable different looks to be achieved. 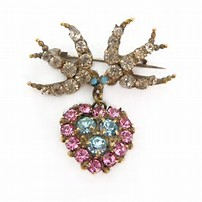 The Victorians were very sentimental and much of the jewellery of that time has hidden meanings. Pearls represented tears and were used in mourning jewellery. Suitors could send hidden messages to their sweethearts in gifts of suitable chosen items. An anchor stood for Hope and Steadfastness. 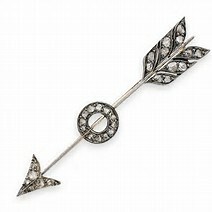 An Arrow for love, as in Cupid's Dart. 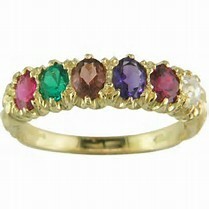 Ruby, Emerald, Garnet, Amethyst, Ruby and Diamond spelt REGARD. After Prince Albert died in 1861 Queen Victoria only wore black clothes and jewellery. 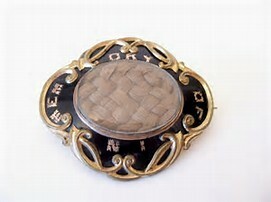 Mourning brooches, often containing hair from the deceased person, were very popular. Jet jewellery became very fashionable and popular with the Queen. Jet is fossilised wood from monkey puzzle trees which is highly polished to produce a lustre of deep opaque black which never fades, the term 'Jet Blac' is well known. Although jet is to be found in many countries world-wide, the finest quality comes from the area around Whitby in North Yorkshire. 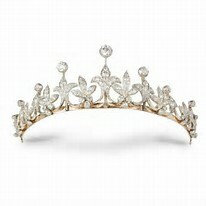 Victoria's reign also saw the birth of the industrial revolution which enabled the mass production of jewellery. Up until then, jewellery had been individually created by specialist craftsmen using precious metals and stones which made it mostly only affordable by the wealthy. Machines speeded up the process of producing items and the introduction of electro-plating and paste stones now made jewellery affordable to people of all classes.